Little Bee by Chris Cleave……….. If you are a lover of words, this book is for you! Chris Cleave must use a magic wand as a pencil. Periods serve not just as a end to a sentence, but as a chance for the reader to stop, take a breath, and reread the words before it. This is so wonderful on many levels. First of all, nearly everyone in the book has a secret, a scar. And with this, Little Bee brings the reader into the secrecy as well. With this, we are a part of it. Come in, dear reader, let me whisper in your ear too. This paragraph also tells you, without question, that Little Bee is a survivor. “A scar does not form on the dying.” She is proud to have survived. My other favorite aspect of Little Bee’s character is that she is forever trying to figure out how she would kill herself if the need arose. Often with humor, she will assess a situation and how best to get out of it. The themes in the book are heavy and the author did a wonderful job of letting us laugh a little in between the intensity. 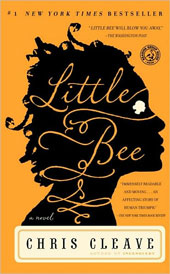 Little Bee is a fabulous story about a young girl who ends up, through no fault of her own, in a detention center for illegal immigrants in England. She spends two years there and the story begins with her release, then returns to outline how/why she was sent there. It is a story about escaping only to be captured and about how being captured might not be the worst case scenario. It is a story of secrets and about the decisions we make in the moment. And then how we must live with those decisions. It is a test of character that some fail, some pass, and some are just too practical to take. The book starts off really strong and I could hardly put it down. The “why” of the story takes a while to unfold – almost a little too long. But the momentum carries you through and holds your attention. After you find out why, the story slows down. At first, I thought it lost some steam. But when I thought about it a little more, I realized that the story simple settled as the characters settled and the ending just faded into reality. The realization sinks in that the characters cannot control every twist in their lives, they must just live through them. ← Heaven is for Real by Todd Burpo with Lynn Vincent………. I’ve been curious about Chris Cleave’s work for some time and your review has convinced me I simply MUST look him up. Thoughtful commentary; glad to see there are still smart, discerning readers out there. Sometimes when I wander through bookstores, taking in the braindead offerings, I have to wonder who’s buying books these days and have they ALL suffered catastrophic head injuries? Thanks Cliff and Welcome to A Reason To Read.